Mohammed and Quraishi (right) ... entrepreneurs. Construction contractors are going online, thanks to businessbid.ae – an online services company that connects customers with vendors. An encouraging response from subcontractors, who are signing up for its services to acquire projects online, is marking a major shift in doing business in the construction sector, said UAE-based businessbid.ae. The portal which has more than 120 registered voters, said it attends to more than a hundred project enquiries a month, and has generated more than Dh100 million ($27.22 million) worth of projects in the last year. Businessbid said it would be a significant boost to the sector by bringing the entire process of awarding construction contracts and sub contracts online. Online services will combine the efficiency and speed of the web with the massive execution of construction projects in the UAE, it added. The key sectors being serviced through the site currently are landscaping, interior design and fit outs. More than 10 various government entities have been awarding job contracts through the portal consistently, said businessbid.ae. Notable among these is a Dh11-million ($3 million) landscaping contract for a government organisation. It services also include processing pre qualifications requests for high end commercial and hospitality projects, including upcoming four and five star hotel projects. 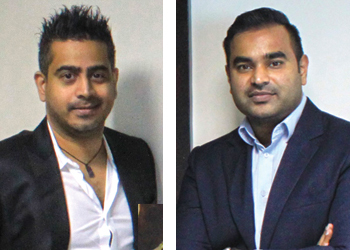 Businessbid.ae, co-founded by technology experts Sam Mohammed and Salman Quraishi, was launched in November 2014. It covers almost 700 defined services in all sectors ranging from residential, commercial, corporate, automotive, lifestyle, education and training. “We wanted to bring value through our technology expertise and experience to UAE, a country we have deeply loved and formed a living relationship with,” said Mohammed, who has relocated from Melbourne, Australia, and holds a post-graduate degree in technology and understands the impact and relevance, technology has made in professional and personal lives. Sam and Salman have strived continuously to enhance Businessbid’s online strategy and product development. “We are keen to enhance the entire sub contracts awarding process, by using cutting edge technology. Technology is a big driver. You need real services and great people behind that technology to create something truly great” said Quraishi, who has years of experience working with several financial institutions and multinational banks. Businessbid covers almost 700 defined services in all sectors ranging from residential, commercial, corporate, automotive, lifestyle, education and training.